Someone commented on yesterday’s entry with a link to Spark People and I went to take a look and will definitely have to give that a try. I realize that I owe Weight Watchers a lot for helping me lose 22 pounds, but right now Mr. Pikko is very concerned about all the doom and gloom talk that economists are having so I need to shave spending. A subscription to WW again is something I want and not something I necessarily need, so I really need to thank mbbored for the referral. Free 99 is most definitely a Pikko kind of price tag! As I mentioned, economy has become a hot issue in my household. To show my support for this, I’m going to start trying to focus on doing more cost-friendly bentos. I might even start a series of a subject like say, 50 Ways to Eat A Costco Chicken. Actually, 50 is a lot… I should start lower with 12 maybe, haha! For now though, I’m trying to uh… purge my fridge and freezer from things that I’ve bought during naughty trips to Foodland. 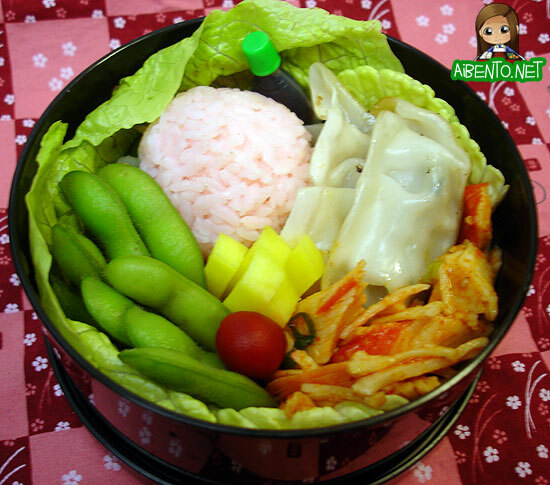 I packed 3 pork gyoza into this bento along with a leftover pink onigiri from the freezer. The fish bottle has soy sauce for the gyoza. Next to it I have kim chee crab, which I will eat with the lettuce that lines the box. In the middle I have sliced takuan, ume, and edamame. When I first got these small round boxes I didn’t really care for them but now I really enjoy packing small lunches into them. I wish I had more of these black lacquer boxes as I really think food in a black box makes for great contrasting colors. I haven’t used my two-tier boxes in quite a while, I guess I am just going through a bento box mood right now. Easter is right around the corner and UGH do I hate holidays like these because it means giving a whole lot of things to a whole lot of kids. Don’t get the wrong idea, I do enjoy giving to kids. But 17 kids? My wallet is crying uncle! My husband’s eyeballs are still rolling around the cash register at Price Busters. My sanity is pleading insanity! (Don’t you just love the feel of Easter grass between your toes?) And this doesn’t even include my own kids and my niece and nephew. After this ridiculousness I’m done with classmate Easter baskets. Next year, I’m having a big Easter card project at my house for my two kids and we’re giving handmade painted egg cards and a healthy snack. This just costs way too much.